How fun to be able to spend my favorite day of the week with one of my favorite people on this planet! I am currently in L.A. attending some major milestone events in our family. Besides being with my loved ones, I get to soak up the joys of my former home town and top of the list is getting time with friends. So how perfect that for Woman Crush Wednesday I get to share the love for a fabulous female chef and also one of my besties at the same time? And my choice for this week is actually inspired by my friend Jane. She herself is a phenomenal cook (she has alot of mouths to feed as she is the mom to 6 kids and 6 grandkids) and an avid cookbook collector. But if you have a look at her bookshelf, one name dominates all the others and that is Ina Garten also known as the Barefoot Contessa. 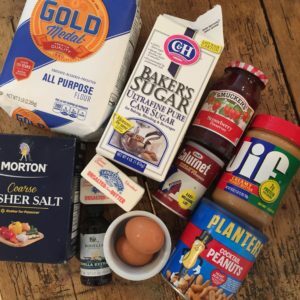 Jane loves the simplicity of the recipes, yet the complexity of flavors. 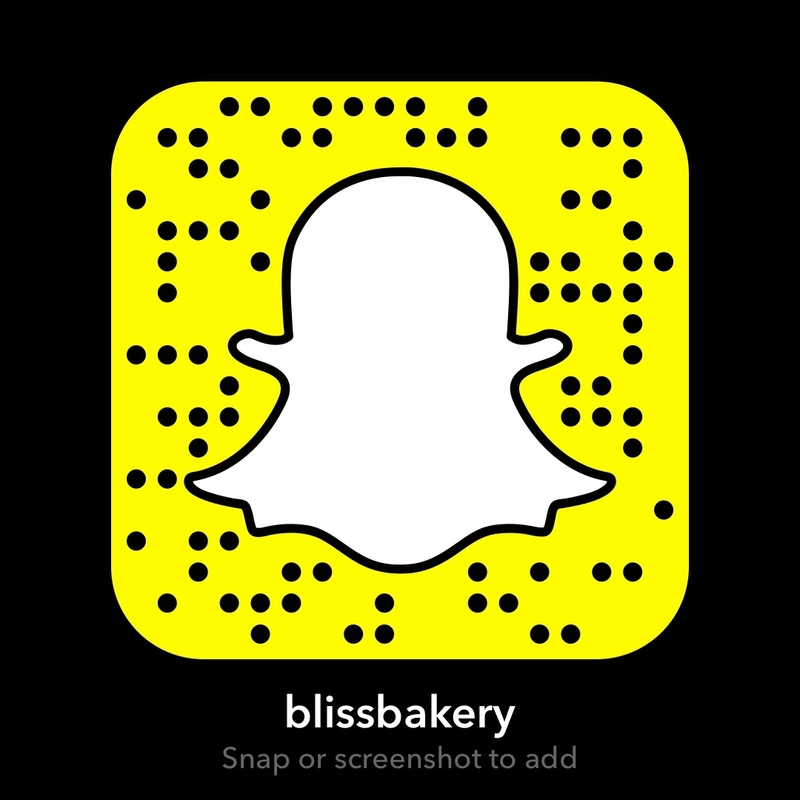 Whether sweet or savory you can’t go wrong with any Ina Garten dish! And I have been converted too! Ina is an amazing choice for #WCW and I am so excited to make one of her recipes for my snapchat cooking tutorial (my username is: blissbakery) and of course on here too! 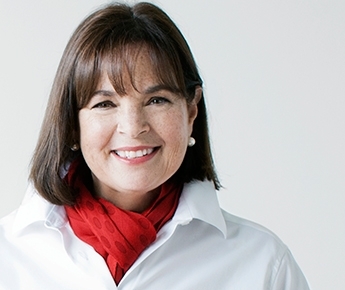 Ina Garten is one of the most recognizable foodies in America. With numerous successful cookbooks and Food Network television shows for which she has been nominated and won an emmy award. 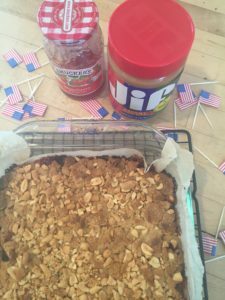 Therefore, since I am in the U.S.A , why not recreate one of the most recognizable American treats (a peanut butter and jelly sandwich) with the Barefoot Contessa at Home’s Peanut Butter and Jelly Bars. Preheat the oven to 350f/180c degrees . Spread 2/3 of the dough into the prepared cake pan and spread over the bottom with a knife or offset spatula. Spread the jam evenly over the dough. Drop small globs of the remaining dough evenly over the jam. Don’t worry if all the jam isn’t covered; it will spread in the oven. Sprinkle with chopped peanuts and bake for 45 minutes, until golden brown. Cool and cut into squares. 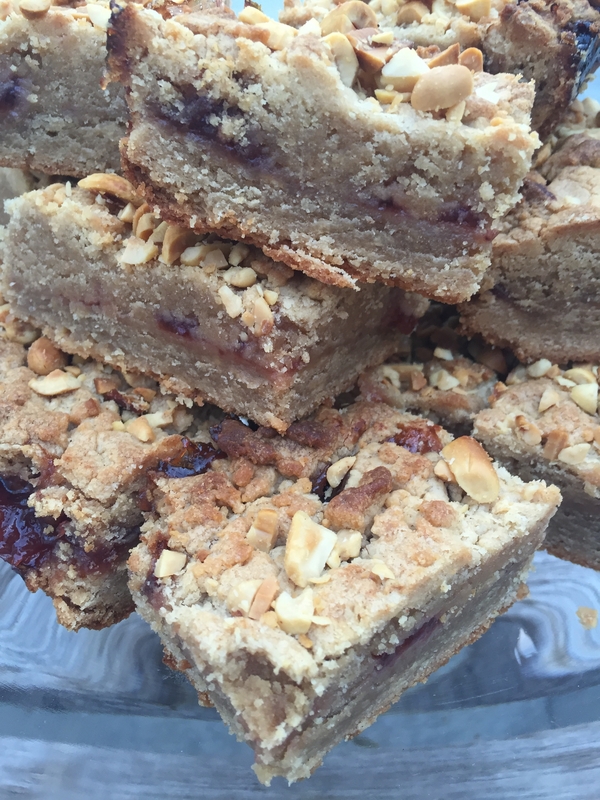 These peanut butter and jelly bars turned out so amazing. I can honestly say they will be on weekly rotation in my house. Melt in your mouth good! They are the perfect combo of a “PBJ” sambo minus the bread. 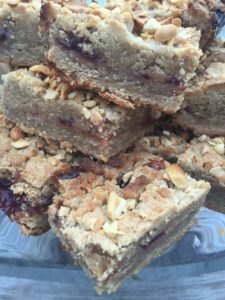 Almost like a peanut butter cookie, but in bar form, with the lovely jam center. I can hardly wait to get back to London to make a batch for my hubby! 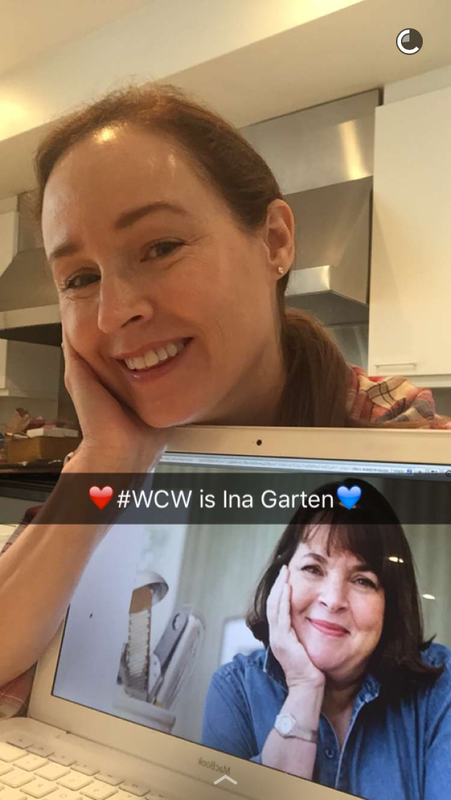 But I am ever so grateful to my friends Jane and Oliver for letting me use their home to host this week’s Woman Crush Wednesday. And it wasn’t such a bad trade for them as they seemed to enjoy these treats too! 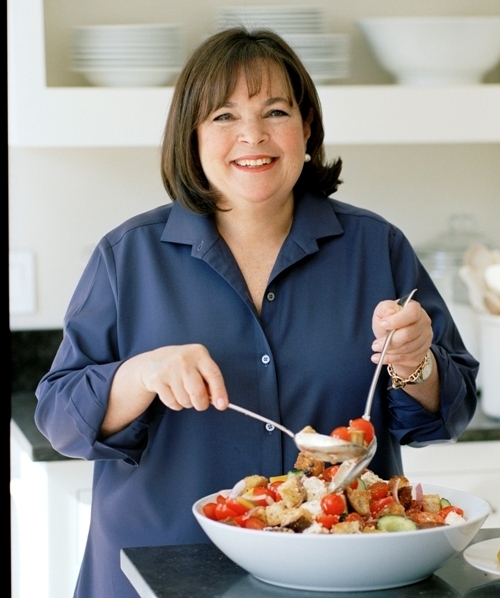 While the world knows Ina Garten as a culinary queen, she never went to culinary school. She is in fact self taught. Ina worked in Washington D.C with the White House and earned an MBA (masters in business) from George Washington University. But she put the business acumen to good use when she opened her wildly successful Barefoot Contessa specialty food store in New York. The “elegant but earthy” ethos has stayed with her and she continues to inspire so many professional chefs and indeed home cooks. I supposed because my hubby is my best friend, one of the things I have always admired about Ina Garten is the fact that her husband plays such an integral role in her culinary journey. He makes appearances in her Food Network show, and even when he is away at work, she still speaks fondly of him as if he is right there with her. She even wrote a cookbook titled “Cooking for Jeffrey” which I like to think of as a gastronomic love letter to her partner. Not only is she inspiring chefs, but also couples on how to keep the love and appreciation alive in a long term relationship. A massive thank you Ina for being you and sharing yourself with the world. You make it look so easy and I supposed that is because you love what you do. You embody that Barefoot Contessa way of life, elegant and earthy, that so many others are striving towards. And your courage to change your professional path towards the foodie world is an example of how we all need to reach for our dreams! God bless you!